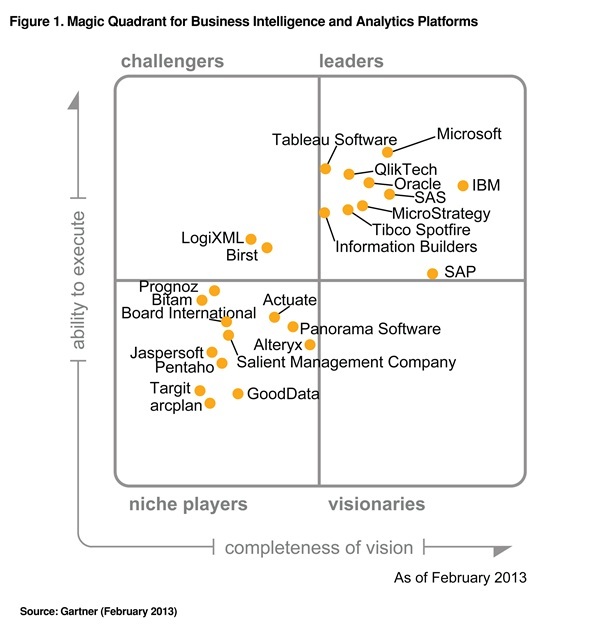 We are excited that the 2013 Gartner Magic Quadrant for Business Intelligence and Analytics Platforms has been released and we are making it available to you. We are also thrilled to be included in the “Leaders” quadrant for the first time. Each year Gartner prepares the Magic Quadrant based on customer reviews, research and deep industry knowledge. There is anticipation by the vendors and the customers to hear the results and the predictions. Gartner is considered one of the premier analyst firms in BI and many customers consider the assessments and predictions of Gartner in determining their tool selection. Some companies will only consider the companies included in the quadrant for their evaluations. This makes the quadrant a badge of honor for software vendors and a rite of passage to grow through the phases of the quadrant into the “upper right,” the Leaders quadrant. You can download the report from here. It is important to understand how the vendors are regarded by their customers, and how the future will impact the software companies’ ability to address their customers' future needs. Understanding the current market, the experts’ perspective on how the market will evolve, and the vendor offerings allows for a better educated product selection to meet the needs of today and tomorrow.